The story of a story within a story is finally coming to an end, as Remedy announces that the next piece of Alan Wake DLC will be the last. 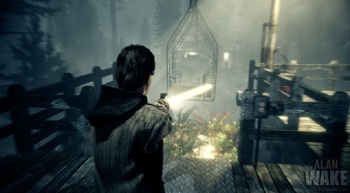 Remedy CEO Matias Myllyrinne has confirmed that The Writer, the second piece of downloadable content for Alan Wake, will bring the story to its conclusion. Myllyrinne didn't go in to detail about the content of the episode, aside from saying that it had some "intense action." It's also been revealed that Remedy has licensed the Depeche Mode song The Darkest Star to play over the episode's closing credits. The song is said to "link strongly" to the game's storyline and Oskari HÃ¤kkinen, Remedy's head of franchise development, commented that it fit the game so well it made the hairs on the back of his neck stand on end. There's still no word on a sequel yet, either positive or negative. Remedy has said in the past that it could see no reason why Microsoft wouldn't exercise its option on a sequel, but it's no secret that the game didn't sell especially well when it came out. It might be that The Writer isn't just the end to Alan Wake 1, but the end of the whole Alan Wake story. The Writer doesn't have a release date at the moment, although it will cost 560 Microsoft points when it becomes available.